Transcendent Events always sets up great concerts featuring a stunning array of Baltimore-area bands. I had the pleasure of attending their Halloween event about three weeks ago, and more than a few bands turned my head. 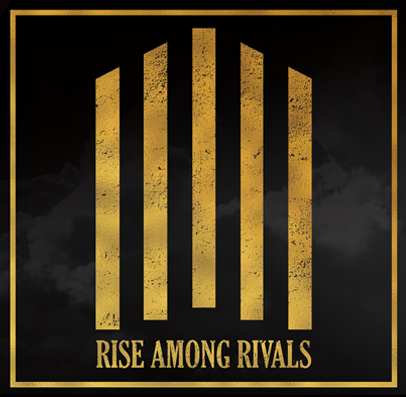 One of those acts was a new group called Rise Among Rivals, a hard rock band whose self-titled EP became available just this summer. Despite only recently emerging on the scene, it was evident that they are not suffering for a fan base, taking stage to an immediately ecstatic crowd. I quickly understood the rationale, as energy erupted off this foursome, delivering an emotional, yet precise, performance. I did myself a favor and grabbed a copy of their singular release to get a better idea of what makes this band tick. What I found were six extremely catchy, well-played tracks; tightly executed rhythms, powerful bass presence, and passionate vocal phrasing. “Left Alone” is a particular favorite of mine, with whistling pipe organs laying the groundwork for David Gascon’s [vocals] emotive vocals to warble overtop, as though they’re passing through a cascading sheet of water, before the dual-guitar sledge of Gascon and Jim Poggi crash down upon us. Jamey McElroy’s immense basslines shake us from underneath, jutting upward with the heartbeat of Christopher Tepper’s percussion. There’s a computerized effect during the song, seemingly imitated by the guitars through slides and other fretboard pyrotechnics, which adds even more flair to an already enjoyable experience. This focus on the second track isn’t meant to diminish the others. I certainly want to address tracks like “Bliss,” with its delicious, bass-heavy launch from the starting gate, the use of both a traditional kit and electronic drum samples to widen the flavor palette, as well as the dynamic see-saw of soft and heavy sections. This last point draws the ear to the spacious verses as well as the explosive chorus, and emphasizes both that much more. Lyrically, Rise Among Rivals largely focuses on relationships that have overstayed their welcome, along with a bit of self-reflection for good measure. While this is certainly not your soundtrack for a happy-go-lucky romantic comedy, there is a note of positivity throughout in the fact that the protagonist of this story is aware of the problems they face and are doing their best to get out of them (the only exception being “Bliss”). And, as I’ve already noted, Gascon is solidly expressive from start to finish, easily drawing the listener into this world to connect with the music. Rise Among Rivals’ first release is tremendously enjoyable. They have garnered well-deserved attention through six songs that are powerful and catchy, and have shown themselves to be a heavyweight contender during their live shows. If they continue this trajectory, having already accumulated quite the following in less than six months, I would not be surprised to see them start to support national acts before much longer. I’ll definitely be paying close attention to what this foursome chooses to deliver in the future, because I have no doubt that it will be fantastic.